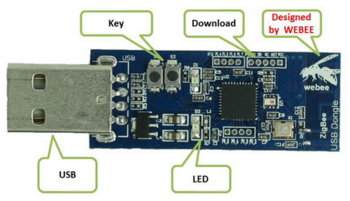 This page is about the CC2540 bluetooth low-energy sniffer dongle and getting it to work with Linux. A nice end result could be that it becomes possible to sniff directly in WireShark with this dongle. I have such a "WeBee" dongle that can be found for about E15,- on websites like Aliexpress. It's supposedly a CC2540 (or compatible) dongle, the USB id is 0451:16b3. When plugging this stick into a Linux machine, you can see it uses only one bulk endpoint. Bus 001 Device 009: ID 0451:16b3 Texas Instruments, Inc.
You can recognise the 2540 type number in there. I've captured a log of the communication over USB while the BLE is capturing bluetooth traffic from some iBeacon, using USB pcap. In the logs, I cannot see any firmware blobs being downloaded to the stick. Probably the stick comes with a pre-loaded firmware of itself to do the BLE sniffing. This appears to be done using USB control transfers. 0x40 0xC9 0 0 - ??? Request type 0x40 is a vendor-specific device request from host-to-device. Request type 0xC0 is a vendor-specific device request from device-to-host. This appears to be done using USB bulk input transfers. I can see a lot of similarities between the USB log and the BLE sniffer log. Each frame starts with a byte indicating the type of frame, following by two bytes indicating the length of the rest of the frame (encoded as little endian). The bulk USB data starts off with two bytes indicating the length of the rest of the data. It connects to the dongle and dumps raw USB packets to stdout. This page was last modified on 13 May 2018, at 21:09.